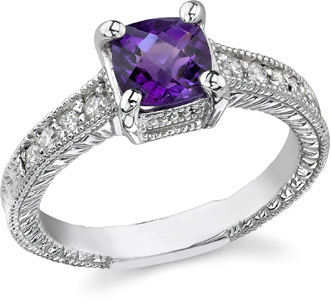 7mm Cushion-Cut deep-hued amethyst gemstone set in .925 sterling silver. Cubic zirconia stones adorn the sides of the ring. Center gemstone weighs approx. 1.25 carats. Also available in 14k white gold with diamonds. We guarantee our 1.25 Carat Cushion-Cut Amethyst Ring in Sterling Silver to be high quality, authentic jewelry, as described above.